With no rain in the forecast for at least the next 10 days, the end is in sight for the late, fall-run salmon season on the North Coast. The Chetco saw a pretty decent return, but the Smith was somewhat of a disappointment. The system had plenty of water, but the big pushes of kings never really materialized, forcing most of the anglers to throw in the towel at the end of November. With the calendar now saying it’s December, it's transition time here on the coast. The majority of the salmon have reached their end destination, and we now wait for the winter steelhead to make their way into all of the coastal rivers. 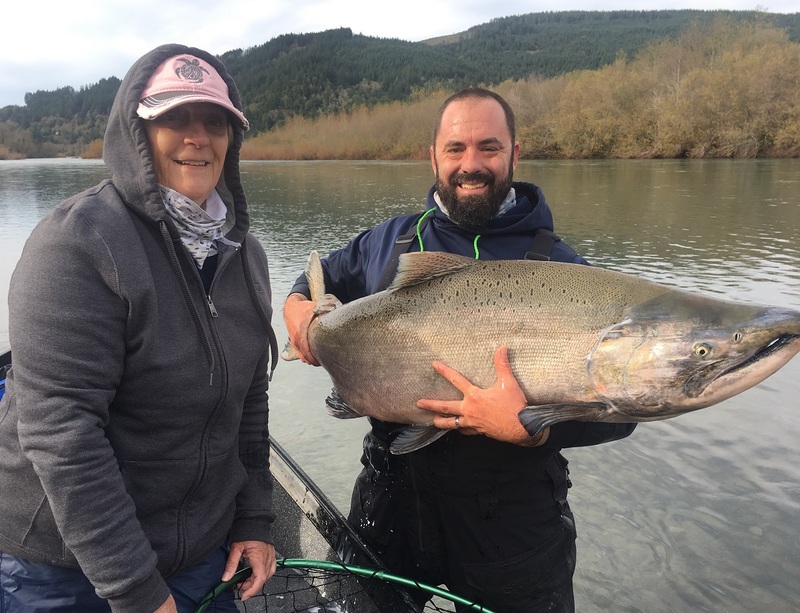 The Chetco has seen a few adults make their way in along with a bunch of half-pounders, and the Smith steelhead should be right behind them. But don’t give up entirely on salmon just yet. The Smith, Eel, Mad, and Chetco should each see another spurt or two of fresh kings move in when and if the rivers rise. Crabbing is still excellent offshore, as well as inside Humboldt Bay reports Tim Klassen of Reel Steel Sport Fishing. He said, “There’s lots of crabs around, we’re not having to pull many pots to get limits for our customers. We’ve dropped some pots in the bay just in case we couldn’t get outside due to weather, and we’re seeing 12 to 14 keepers per pot. The crabs in the bay aren’t quite as clean as they are on the outside, but they’re just as tasty. Both outside and in the bay, the crabs are getting fuller — we’ve seen a definite improvement,” Klassen added. The weather looks good through the weekend, with light winds and swells running between five and seven feet. All North Coast rivers subjected to low flow fishing closures, including the Smith, Eel, South Fork Eel, Mad, Redwood Creek, and Van Duzen are currently open to fishing. Some of the rivers could close next week due to low flows. Be sure and call the low flow closure hotline, (707) 822-3164, to determine if the river is open prior to fishing. Salmon fishing is winding down on the Elk and Sixes, although a few kings are still showing up. Both rivers will be low by this weekend according to Martin. With no rain for a couple weeks, we’re dealing with low and clear conditions reports guide Mike Coopman of Mike Coopman’s Guide Service. “There haven’t been many boats out as most of the guides have cancelled their salmon trips due to lack of fish. The steelhead should start to trickle in at any time. Even if the water is low, they can still make a pretty good showing, you just never know from year to year when that will be.” As of Wednesday, flows were right around 3,000 cfs on the Jed Smith gauge. 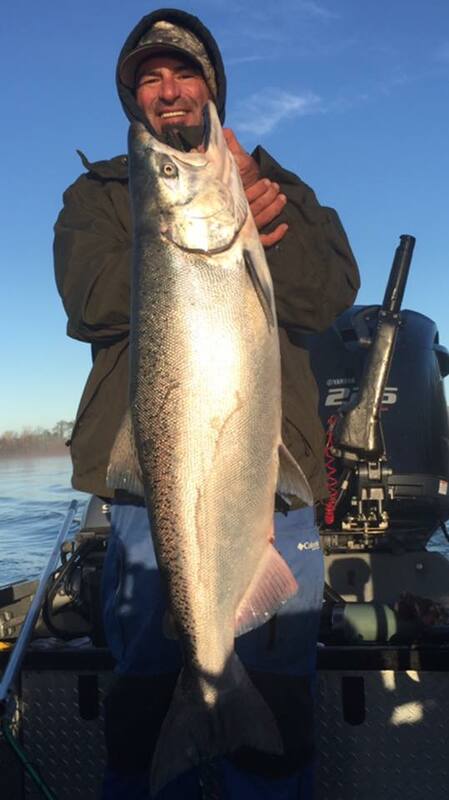 The river isn’t loaded, but there are a few fish around according to Justin Kelly of Eureka’s RMI Outdoors. He said, “Most of the guys who put some time on the water last weekend hooked a fish or two. The scores weren’t red hot, but there were fish to be had. There’s a pretty good mix of both salmon and steelhead in the river, with quite a few bright salmon still making their way up. Most of the steelhead caught have been wild, but there are a few smaller-sized hatchery fish around. The water is dropping, but it still has some good color. Even with the lack of rain, we should see the steelhead push in.” As of Wednesday, the Mad was flowing at 760 cfs and dropping but it should remain open through the weekend and early next week. The main stem is in good shape, with some really nice color reports Paul Grundmans of Grundmans Sporting Goods in Rio Dell. He said, “I haven’t seen much activity on the river, and haven’t heard of any fish being caught. 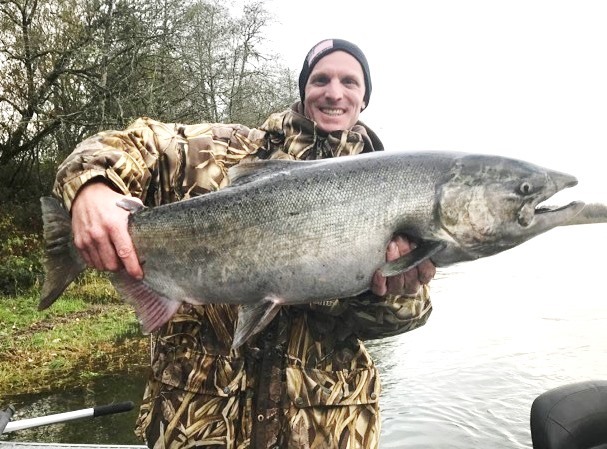 We should see some late kings and a few early steelhead start to show, although we typically start to see the steelhead show up in bigger numbers by mid-December,” Grundman added. The flows were 1,900 cfs on the Scotia gauge on Wednesday afternoon and predicted to be around 1,500 cfs on Saturday. The South Fork was running at just around 500 cfs on Wednesday, but holding decent color. It should remain open to fishing through the weekend, but could close next week due to low flows. There’s some older salmon around, along with a few fresh kings. A few half-pounders have made their way into the system, and the adult steelhead should be showing up any time.